Spurs forward Son Heung-min attempted to defuse the pressure surrounding the Asian Games football final that could make or break his career on Friday, as Japan edged China to win the women's gold. Rarely has a player had so much at stake as Son, who faces a 21-month spell of military service unless the South Korea team win an exemption by beating Japan on Saturday. But the 26-year-old World Cup star did his best to downplay the situation, and said he trusted his young team-mates to keep the title in South Korean hands. "Of course it's an important game, it's a final, but it's normal -- I'm not thinking of it any differently," said Son, one of three over-age players named for the under-23 team. "But we are ready and we're hungry to win the tournament. We have a lot of young, inexperienced players but when I look into their eyes I can see that hunger." Son will hope the men's final doesn't turn out like the women's, a tense and attritional match in heavy rain which Japan settled in the last minute. With only 30 seconds on the clock, forward Mana Iwabuchi crossed from the right wing to set up substitute Yuika Sugasawa's glancing header -- Japan's first and only attempt on target against the Steel Roses. Japan's women also snatched hockey gold with a 2-1 win over India, and Yuko Takahashi won the women's triathlon as the Japanese title haul swelled by 10 to 69, still a distance from China's uncatchable 118. South Korea lie third on the medals table with 43, ahead of hosts Indonesia on 30 -- a record for a Southeast Asian country. Qatar's team brimming with naturalised players won the men's handball, beating Bahrain 32-27 in the final, to become only the second country after South Korea to successfully defend the title. China remained perfect in the diving competition as Wang Han and Chen Yiwen went one-two in the women's 1m springboard, and Xie Siyi and Cao Yuan repeated the pattern in the men's 3m springboard. In sailing, Japan's Akira Takayanagi battled stomach pains after swallowing dirty sea water to win a gold medal in the men's 470 event with team-mate Tetsuya Isozaki. He was one of several sailors struck by stomach cramps, diarrhoea and fever in Jakarta, where the surrounding bay is heavily contaminated by sewage. "I had a really bad stomach earlier in the week, probably from getting the water in my mouth," said Takayanagi. Hong Kong's former Olympic bronze medallist Sarah Lee Wai-sze defended her women's sprint crown to end the track cycling competition with two gold medals. "Last night I couldn't sleep very well," Lee said. "But I was more confident and stronger than the others and that's why I performed well." 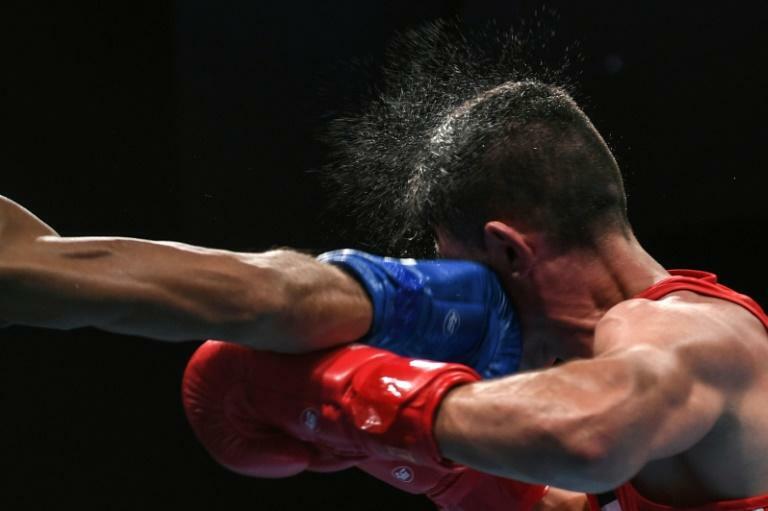 Uzbekistan were lords of the boxing ring on semi-final day, with all six of their fighters reaching Saturday's finals. Mongolia's Narantsetseg Ganbaatar became the first gold medallist in sambo, one of the martial arts making its Asian Games debut, when she won the women's -48kg category. And Taiwan won both the men's and women's 20km gold medals as roller skating, only contested once before at the 2010 Games in Guangzhou, made a reappearance.